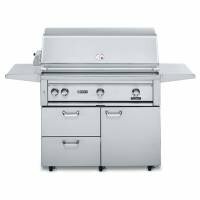 Lynx describes this professional quality 42-inch gas grill as a mobile kitchen. Over 800 square inches of primary cooking grill plus a warming grill over 300 are powered by a burner system with an output of 75000 BTU's. Two of the cast red brass burners can be topped with ceramic briquettes to convert dripping fats to smoke, and a third Pro-Sear burner provides fully controlled infrared heat over a full range of temperature settings. Built-in lighting is standard under the hood and behind the controls for convenient operation during late evening cookouts. A heat stabilizing system deflects wind away from burner flames when the hood is closed, keeping the temperatures constant. For wood smoke flavor, a removable stainless steel box can be filled with wood chips and pulled out for emptying ashes and cinders. The side shelves fold down for easier storage of the movable cabinet grill, which is mounted on six heavy duty casters. Two storage drawers are included, and the stainless steel cabinet doors hold condiment shelves that can be removed for cleaning. The housing itself is a gap free design, assembled with heli-arc welding techniques that creates a seamless weather resistant shell. Topping off the list of perks is a three speed rotissierie, adjustable to two positions, heated by a separate infrared burner. Compare this with the Kalamazoo Stainless Steel Propane Grill.